Chris Alexander, founder of Macro Link Agency, has become the Jerry Maguire of the hedge fund industry. 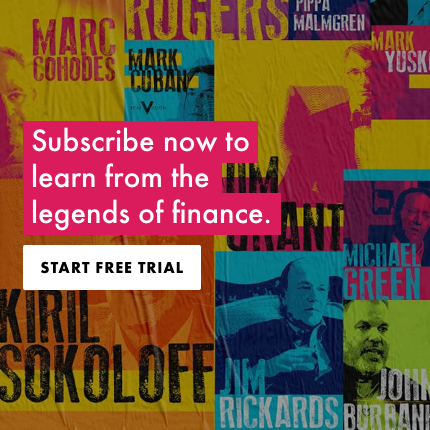 In this wide-ranging conversation with Roger Hirst, he provides his unique perspective on the industry, and discusses the coordinated actions of central banks as well as the resulting decline in volatility. Indeed, Chris believes policymakers are putting off the hard choices, creating a significant opportunity for particular hedge funds. Filmed on February 4, 2019 in New York. I really enjoyed this unique interview. However, i was struck by his perspective regarding the potential for Trump to be removed from office during his first term and his thesis that this would create a more stable environment. I couldn’t disagree more. If the deep state coup succeeds and they remove a duly elected President you will end up with total chaos and potentially a civil war. It might be helpful to interact with non-coastal Americans from time to time. And kudos to both of them. Roger brings the experience to really draw out a good interview and I always enjoy his participation. I'm so glad I didn't cut out in the last 4 minutes. Chris correctly identifies the problem that allocators/advisors have today. It started with managers being held to task to tracking the SPX back in the 80s, and then MPT coming into play in the 90s, to where it's a standard to seek average performance. Hedge funds "were" the avenue to seek higher performance and now they're being sucked into the vacuum. All things come back around so I do see a day where the pendulum swings back, but when does that day come? I may not be around. And I'm that kid back in the mid 70s who thought the arguments for plastic bags over paper bags was BS. 40 years later, I'm right. So I'm no expert in timing the larger issues. May I please make the suggestion that you change the title of this video? I have very little interest in the future of hedge funds and therefore almost didn't bother watching this piece. I am sure many people are missing out because the title doesn't do the content justice. An informative and interesting conversation - thank you gents! Ive known Chris for 20 years and this interview surprised me in how fascinating it was and Chris is a fascinating guy anyway... Really, really good. Great interview. Interesting insight into some of the key players in macro. Simply Fantastic!....and out of the Blue. Chris was fantastic as was the subject matter. Roger did one of the best interviewing jobs to date and I for one think his curation for us of this material was just Vintage RV at it’s finest. I couldn’t be anymore effusive about this video! I would like to go into another process/procedural topic if you will allow me to do so—Having been with RV almost since inception and having watched almost every Video until the last six months (when RV began a new Chapter which includes throwing up a plethora of material which is extremely varied by, content, time of Video, complexity—running from the complex to the “starter kit”, and production graphics and sound, etc.) my experience has been that I have to really work to find those segments that really make my beanie twirl. The first couple of years I could watch each video to completion and almost always thoroughly enjoy the experience. I have learned with the “new” RV formats to simply be curious and give many of them a short try to see what they are about.....and this is what I would encourage my fellow RV’ers to do—I almost missed this one because It didn’t jump out @ me, but I am Sooo glad I got into it a bit as I will watch it several times and wait with baited breath for Chris to come on again. We all have different tastes and are searching for the nuggets that we can get from RV to improve our investing dynamics and Portfolio construct....and what I’m urging is to learn to “curate” a bit for yourself and find those segments that, to quote an old friend, “Make You Go Hmmm”—those Goodies are out there just waiting to be found.....and do try the Archives as well (I just watched a David Iben from 2015 that was even better than when I watched to the first time). The only thing I didn’t like about this video was Roger trying to almost justify it being a bit different! Great interview in my opinion, and it highlights actually how things work in reality as opposed to just a theory with the opportunity being there because of structural issues as opposed to just fundamental ones. I think the more of these the better as people need to learn the idiosyncrasies of that practitioners because human or not, its those that move the market. Interesting viewpoint! Really liked the rock-paper-scissors analogy. I guess the main tactical problem is the lack of clean trends in rates and G10 FX. But above all that “the big Macro HF” are too indeed too big to really extract a decent amount of alpha in an ever more efficient market. On top thanks to central bank monetary policy their unencombered cash has been yielding 0% instead of the 5% of the past and that already explain why perf has dropped so much. Loved the perspective from a different angle! Appreciate the Ferguson and Fed reference, however the interview seem to fall short of "The Future of Macro Hedge Funds". Personally, I would have liked to see Roger quiz him a bit more on his profession and Macro Link Agency as opposed to chatting about J Pow. A refreshing topic nonetheless, thanks RV! The interviewer sounds exactly like the Siri for Ninjatrader. Anyone who uses NT will know what I'm talking about...uncanny. Also, good job and insightful interview. Really enjoyed some of the ideas thrown around and seeing how some hedge funds are viewing the "end of the world." If I could provide some constructive criticism, in a piece called "The future of macro hedge funds," perhaps naming at least one hedge fund would be warranted? All the abstract has its place, but some specifics would provide more meat on the bone. Is Policy Driving Markets For Once? Where Do Hedge Funds Go Now Then?